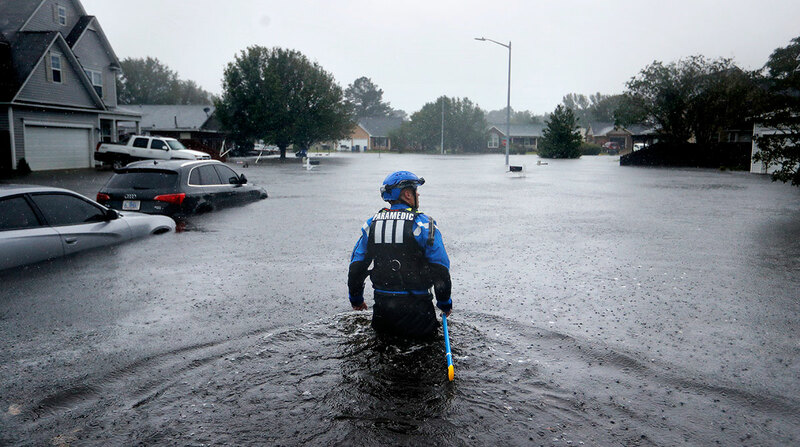 WILMINGTON, N.C. — With Wilmington cut off from the rest of North Carolina by still-rising floodwaters from Florence, officials plan to airlift food and water to the city of nearly 120,000 people as rescuers elsewhere pull inland residents from homes swamped by swollen rivers. The deadly storm still was dumping rain and had top winds around 30 mph early Sept. 17, but forecasters said it was expected to gradually pick up forward speed and complete a big turn toward the Northeast. Flooding worries were increasing in West Virginia and Virginia, where power outages also were rising. About 500,000 homes and businesses were in the dark. The spreading disaster claimed additional lives Sept. 16, with at least 17 people confirmed dead, and the nation’s top emergency official said other states were in the path this week. - Wilmington INACCESSIBLE by land. DON'T travel, let responders work. - Sections of I-95/40 flooded. No reopen time until crews assess damage. “Not only are you going to see more impact across North Carolina … but we’re also anticipating you are about to see a lot of damage going through West Virginia, all the way up to Ohio as the system exits out,” Brock Long of the Federal Emergency Management Agency said Sept. 16 on Fox News. In Wilmington, the state’s eighth-largest city, residents waited for hours outside stores and restaurants for basic necessities such as water. Police guarded the door of one store, and only 10 people were allowed inside at a time. In Anson County, east of Charlotte, a train derailed Sept. 16, but it wasn’t clear whether it was storm-related or if anyone was injured. Several cars of a CSX train left the tracks, WBTV reported. The derailment led to at least one road closure. Officials have reported flooding caused by Florence in Union County, located between Charlotte and Anson County. Florence still was massive, despite being downgraded to a tropical depression from a once-fearsome Category 4 hurricane. Radar showed parts of the sprawling storm over six states, with North Carolina and South Carolina in the bull’s-eye. Near the flooded-out town of New Bern, about 455 people had to be rescued from the swirling flood waters. In the neighboring town of Trenton, downtown streets were turned to creeks full of brown water. The rain was unrelenting in Cheraw, a town of about 6,000 people in northeastern South Carolina. Streets were flooded, and Police Chief Keith Thomas warned people not to drive, but the local food and gas store had customers.